When all of your festive energy has gone into making the perfect Christmas Eve dinner and wrapping gifts for loved ones, this is a dish that will let you relax on Christmas morning. Strata is a layered breakfast casserole that can be made ahead of time with delicious gooey ingredients. In a sauté pan, over medium heat, cook sausage meat while breaking up with a spoon. Once meat is cooked through, removed from pan and reserve. Add butter to sauté pan, with pork renderings, and melt over medium-low heat. Add mushrooms and thyme and sauté until mushrooms are softened. Remove from heat and set aside. In a large bowl make custard mixture: whisk together eggs, cream, nutmeg, mustard powder, and season with salt and pepper. Grease a 9 Inch X 13 Inch baking dish. 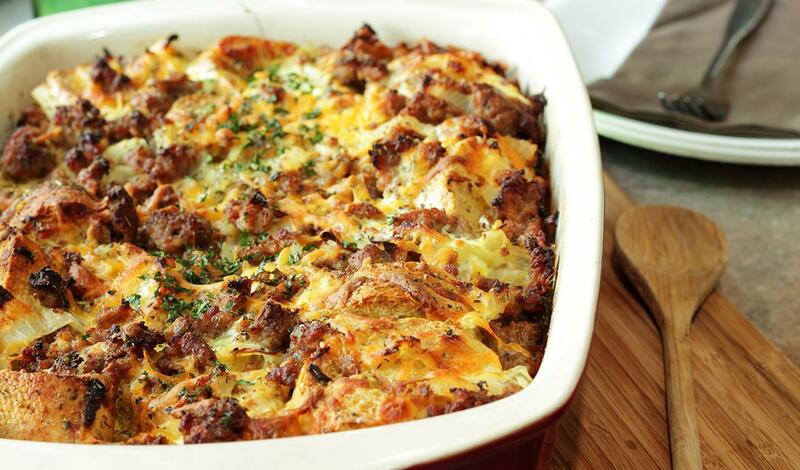 Lay 6 pieces of bread on the bottom of the casserole dish and top with sausage, mushroom, and cheese. Repeat process until casserole dish is full ending with bread on top. Pour custard mixture over contents of dish and top with cheese. Bake, covered, for 30 minutes, remove cover and continue baking for 30 minutes.